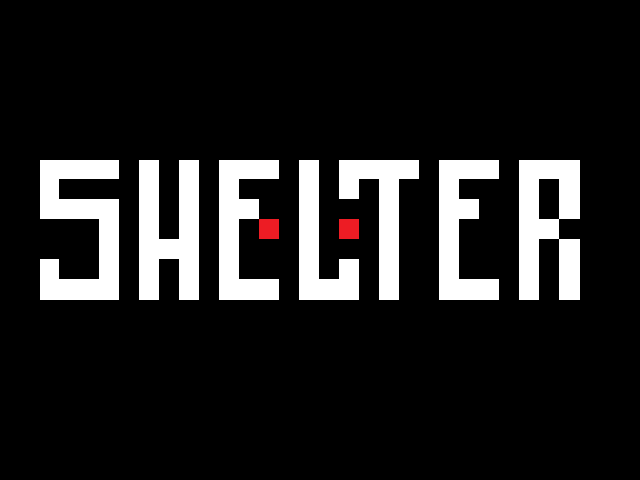 Shelter is a Real Time Strategy Survival Horror game about building a shelter to survive an onslaught of zombies. Save new units to join your team, harvest materials to keep your shelter functioning and survive near pitch black nights as your walls are bombarded by the living dead. Start with only four survivors. Hunt for food or starve to death. Gather supplies or be eaten alive at night. Kill the infected, or risk losing everything. Pretty impressive game. I've barely dug in, but one thing that threw me off right away was that the buttons look disabled but turned out not to be. I thought that might be an issue. Maybe we'll have to update that later so we don't steer people away. Thanks for the feedback. There's a lot to do in the game. You can easily put a few hours into it. Very good game. I really like the concept and the design. Nice work. PM me if you require help. I'm always glad to help out! When it's night, how long do I have to wait before day 2 start? I did wait about 1min, but everything was just dark, so I gave up Is it possible to add lightsource or something like that? How can I delete like a wall piece I placed wrong? I did like the game and I will be using more time on it. 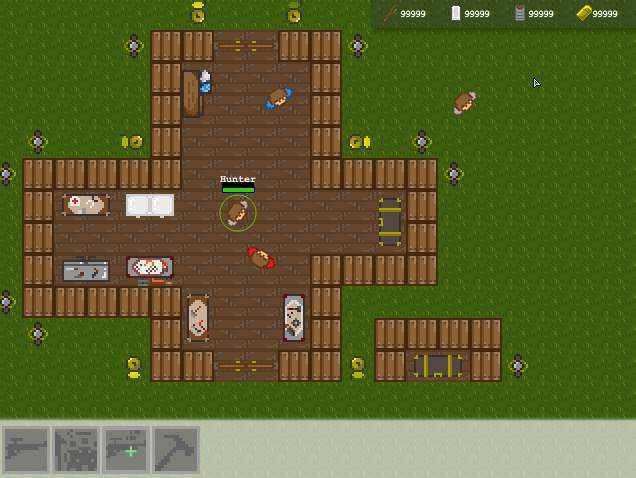 The controls are a bit complex and difficult for new players. Once you get the hang of it and know the controls, the game gets much better. 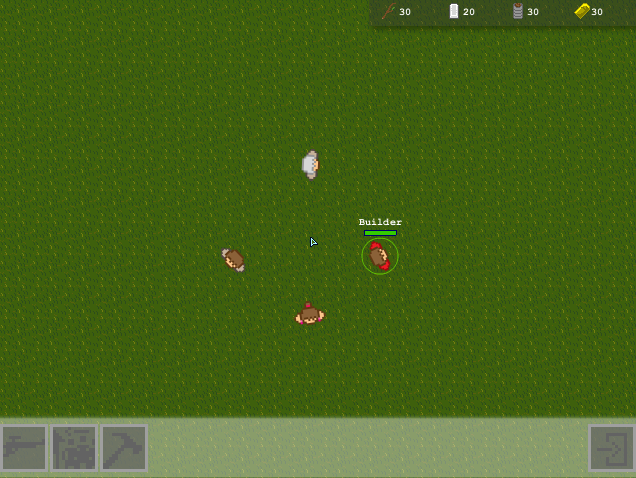 G + Left Click salvages (or sells) anything you've built for half it's original cost. Night lasts approximately 3 minutes. Building a Mechanic's Bench (The red and gray bench with the orange accessories hanging off at the top) will unlock a lantern build. Lanterns will turn on at night so you can see much better. Be aware though that placing too many lanterns over the top of each other will create major brightness problems and you won't be able to see. Multiply effect issue. Thanks for playing! I think the game really expands the basic uses of Stencyl and really shows how powerful the engine really is. If you find any bugs or have any more questions feel free to ask. Game frozen. Happened after selected "Job changer"
About the control, it's very difficult :O optimal you only needed to use the mouse. Like select one wall piece when an “x” appear so you can delete it. Or moving the camera with your mouse. Idk how to make something like that. But I have played stencyl game with that function. Same goes for select unit. Where you could drag a rectangle over your unit to select them. For following person, you could have a follow button like build etc, witch say follow and then if you press that, next person you select will be the “follow target” etc. I did follow the tutorial. It was a lot of text so it is possible that ppl give up because of that. Something should happened to the control to make it a bit easier. Then you could make a guide with less text. Also it was some problems with the zombies. They did try to attack my survivors inside a house a made. They didn’t try to attack the wall, just stood there. When a game freezes, hitting ` will expose the error. Wanted to shout out and say that this game made an Honorable Mention. It takes a long time to dig into (and for that, it's not quite practical for most), but once you dig in, there's a lot to do. I'd be really curious to see if you could pull off a more traditional RTS down the road.